Sydney Hotels - Overview of Sydney hotels and motels. Sydney boasts a huge range of international and local chain hotels throughout the City and suburbs. Holiday Inn, Hilton, Nikko, Renaissance, Westin, Novotel, Parkroyal, Centra, Regent, All Seasons, Rydges, Metro Hospitality Group, Mercure, Sheraton, Marriott, Inter-Continental, Hyatt and Ibis are all represented, along with motor inns, serviced apartments, budget hotels and even backpacker accommodations. 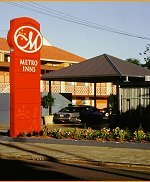 Metro Hospitality Group is the largest motel operator in Sydney with properties in and around the city. Country Comfort, another national chain, has a property on the North Shore at Lane Cove.